Truckee runningback Marcus Trotter will lead the Wolverines into a week two matchup against Bret Harte on Friday, Aug. 24 at 7 p.m.
After taking it to the defending Class 3A Northern League champions to open the season, the Truckee football team will remain home this week, playing in back-to-back night games under the lights at Surprise Stadium for the first time ever. The team’s 34-17 win over Fernley last Saturday has the Wolverines in the driver’s seat as the group prepares to take on its only nonleague foe of the season this Friday, before jumping back into league play. 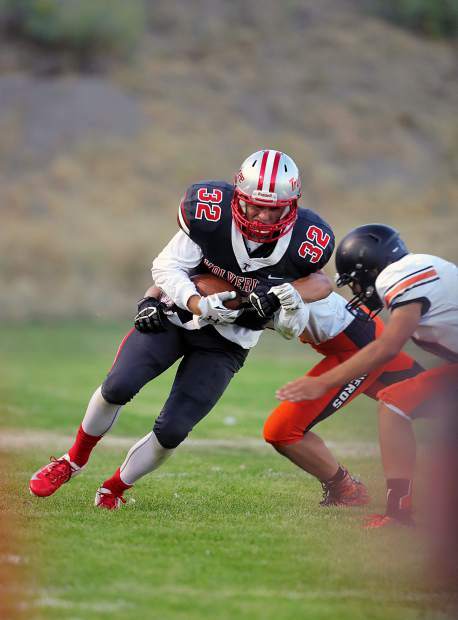 Trotter helped key Truckee’s win with 119 yards rushing, including a 54-yard touchdown run. As a team, Truckee piled up 317 yards on the ground against the Vaqueros, while senior quarterback Marcus Bellon passed for two touchdowns on an efficient 7-of-8 performance through the air. Defensively, Truckee caused two fumbles, forced an interception and shut out Fernley in the fourth quarter. Though Truckee got the win, Head Coach Josh Ivens was less than satisfied with the team’s performance, stating he wanted to see a better pace from the offense. In the practices leading up to this week’s game against Bret Harte, who Truckee routed 61-7 on the road last year at Angels Camp, California, Ivens said the Wolverines offense has done a better job of pushing the pace. Bret Harte got off to a rough start this season, suffering a 50-27 defeat against Orestimba. And while Ivens said he’s looking to use the contest to tighten things up before Truckee jumps back into league play, the Wolverines aren’t taking the Bullfrogs lightly. The squad returns third-year starting quarterback Ryan Kraft, and features a roster heavy on senior players. Senior running back Ryan Miguel also poses a threat, having ran for more than 100 yards in the team’s season opener. Truckee and Bret Harte will take the field at Surprise Stadium on Friday, Aug. 24 at 7 p.m.